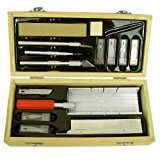 30 piece Hobby Knife & Miter S.. Product weight is 0.035 lbs. Features: Mini miter-box and fine-tooth stainless steel saw for easy angle cuts Small, medium and large knife handles with firm-grip blade collets 30 razor-sharp surgical-steel blades in six different styles and sizes Awl-pick handle Tweezers and sanding block All in custom-fit wooden storage box 75-1630 Features: -Awl-pick handle.-Tweezer and sanding block.-All in custom-fit wooden storage box.-Mini miter-box and fine-tooth stainless steel saw for easy angle cuts.-Small, medium and large knife handles with firm-grip blade collets.-30 razor-sharp surgical-steel blades in six different styles and sizes. Dimensions: -Dimensions: 4.75 H x 10.13 W x 6.38'' D.